Located next to the hotel's main lobby, the Wynn Las Vegas dealership was a joint venture between the casino and Penske Automotive Group. 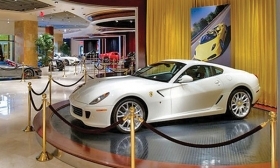 The Ferrari-Maserati dealership formerly located inside the Wynn Las Vegas casino and hotel has been purchased by a downtown Vegas luxury car dealership. Towbin Motorcars purchased the dealership, which closed last week, and reopened it at its downtown Las Vegas location. In addition to the new inventory, Towbin brought 15 Wynn dealership employees to the downtown location, bringing the total staff to 44, the dealership said in a statement. Ferrari and Maserati join Rolls-Royce, Aston Martin and Bentley as luxury brands sold by Towbin. “The acquisition is important for our dealership because it defines Towbin Motorcars as the most exclusive car dealership in Las Vegas,” Towbin Chairman Carolynn Towbin said in the statement. Located next to the hotel’s main lobby, the Wynn Las Vegas dealership was a joint venture between the casino and Penske Automotive Group. Both sides said the decision to sell the dealership was “mutual,” and a Wynn spokesman told Automotive News last week that “something special” is being planned for the vacated 10,000-square-foot space, though he declined to elaborate. A Penske executive declined to comment on sales at the store, which charged visitors $10 to peruse the showroom. The store opened in 2005. The purchase price of the dealership was not immediately disclosed.